Albion Sen. Tom Briese, sponsor of LB1084, said that the average Nebraskan pays more in property taxes than state, local and motor vehicle sales taxes combined. At the same time, he added, Nebraska is nearly last in the nation in the percentage of public elementary and secondary education funded by the state. Briese said it is clear that Nebraskans—in both rural and urban areas—are demanding property tax relief. All the new revenue generated by LB1084, except for the increased aid to school districts, would be deposited in the property tax credit cash fund. The state Department of Revenue estimates that the bill would direct an additional $234 million to the fund in fiscal year 2018-19 and a further $418 million in FY2019-20. The fund currently holds approximately $224 million. The state Department of Education estimates that LB1084 would increase state aid to schools by $144 million in FY2018-19 and that all of the state’s 244 school districts would receive additional state aid as a result of the bill’s changes to the school funding formula. LB1084 would increase the state sales tax from 5.5 percent to 6 percent beginning Oct. 1, 2018. It also would impose sales and use taxes on more than a dozen services, including investment advice, hair care, lawn care and massage. Soft drinks, candy and bottled water also would be subject to sales tax. The bill would eliminate sales tax exemptions for school meals and the fees and admissions charged for political events, school events and nonprofit sporting events. Sales tax exemptions for capital gains, fine art purchases by museums, zoo memberships, newspapers and certain other purchases would be repealed, as would the state sales tax exemption for motor vehicle trade-ins. It also would impose a surtax on anyone who is subject to state income taxes and has a federal adjusted gross income of at least $500,000. The tax would equal 2.5 percent of the AGI of those earning at least $500,000 but less than $1 million. It would equal 5 percent for those with an AGI of $1 million and above. Additionally, LB1084 would increase the excise tax on a pack of cigarettes from 64 cents to $1.64, directing the additional proceeds to the state’s property tax credit cash fund. The bill would end two tax incentive programs and the personal property tax credit program after 2018, and it would require internet sellers without a physical presence in Nebraska to collect state sales taxes if their sales total $100,000 or more or if they made at least 200 transactions. LB1084 would impose a Nebraska alternative minimum tax and would repeal an adjustment that allows individuals to decrease their adjusted gross income for non-Nebraska source income earned through a pass-through entity. The bill also would restore cuts to state aid to schools made last year and would increase the amount of allocated income taxes to schools from the current 2.23 percent to 20 percent. However, it would limit the amount that school districts can request in property taxes each year. Finally, the bill would require the state Department of Education to oversee an in-depth review of the financing of public elementary and secondary schools. The report would examine methods of school financing that would offer alternatives to a heavy reliance on property taxes. 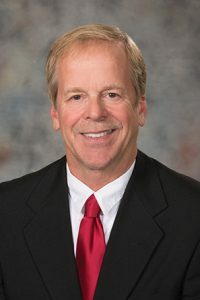 Al Juhnke, executive director of the Nebraska Pork Producers Association, testified in support of the bill on behalf of the Nebraska Agriculture Leaders Working Group. The ad hoc group, comprising officers and staff from six of the state’s largest farming and ranching organizations, supports LB1084 because it provides substantial property tax relief while generating new revenue and ensuring adequate funding for public education, he said. Amie Kopcho, a York Public Schools board member, also testified in support of the bill, saying that a review of public school financing is long overdue. She said close to 70 percent of the district’s funding comes from local property taxes and less than 17 percent comes from the state. Tiffany Joekel, policy director at OpenSky Policy Institute, also testified in support of the bill. She said it would broaden the state’s sales tax base while eliminating tax breaks and loopholes for special interests. “It is the only fiscally responsible solution on the table that provides a path to meaningful property tax reform while protecting state budget priorities like health care and K-12 education,” Joekel said. Testifying in opposition to the bill was Coby Mach, speaking on behalf of the Lincoln Independent Business Association. He said the association is concerned about a proposed increase in sales and use tax when Nebraska retailers already are in competition with online sellers that are not required to collect those taxes. The association also opposes taxing personal care services because those providers already pay income taxes, he added. Nicole Fox, director of government relations for the Platte Institute, also testified in opposition to the bill. She said the Platte Institute agrees that Nebraska should increase its sales tax base by taxing additional services, but it disagrees with how LB1084 would use the additional revenue. Without proper safeguards in place, Fox said, the bill could only accelerate local spending. “We are concerned that LB1084 does not have a strong enough mechanism to ensure that local property tax entities will reduce levy rates in response to receiving these new revenues,” she said. Stacy Watson, speaking on behalf of the Omaha, Lincoln and Nebraska chambers of commerce, also testified in opposition to the bill. The chambers specifically oppose repealing the income tax adjustment for non-Nebraska income earned from an S corporation or an LLC, she said. The proposal would discourage new businesses from coming to the state, Watson said, and it likely would not increase revenue because many businesses would switch to C corporations to avoid it. “We request to remove these provisions from the bill so that they don’t unfairly tax the individuals versus the C corporations as they currently exist,” she said. Also testifying in opposition was Herb Freeman, president of the Nebraska Realtors Association. He said the proposed sales tax on real estate services related to single-family homes is unfair because similar services for commercial, multi-family, industrial, retail or other property types would not be taxed. “We would submit to you that single-family homeowners are not a special interest group,” Freeman said.